Coeur d'Alene is a fast growing town in northern Idaho's panhandle. This town on the shores of Lake Coeur d'Alene attracts retirees and tourists because of the outstanding beauty and outdoor recreation available here, including biking of all types. 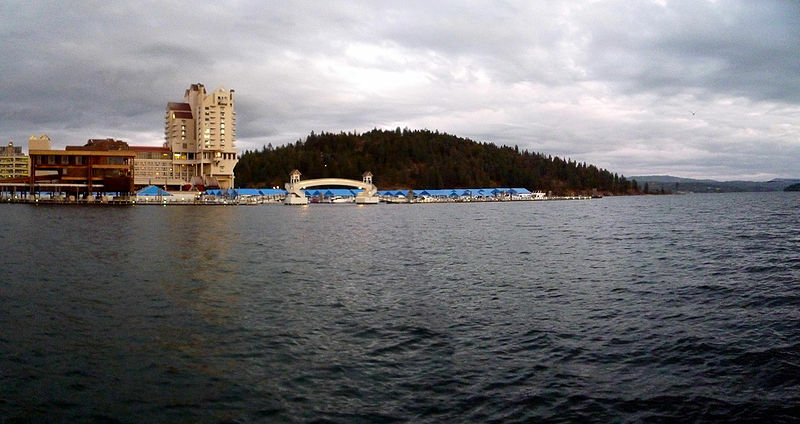 The Coeur d'Alene Resort is a major attraction for the area. Coeur d'Alene is also located near two major ski resorts, Silver Mountain Resort and Schweitzer Mountain Ski Resort. Excellent road and mountain biking is nearby. 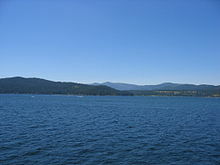 Photo of Coeur d'Alene courtesy of and per license of Wikipedia and Bobak. There are several active adult communities in the area (see link on left). According to Zillow, the median home value was $297,500 in late 2018, which is up over 14% from the previous year. Barbara Walters called the city "a little slice of Heaven" and included it in her list of most fascinating places to visit. Good Morning America once broadcast from here to show its amazing Christmas Tree lights display. Being on the shore of a long (25 mile) Lake Coeur d'Alene makes it special. Riverstone is quite a large and successful new complex. The Coeur D'Alene Resort Golf Course its top-rated and has the world's only floating (and movable) green. This is a very remote area and the winters are chilly. Coeur d'Alene is in the northernmost part of Idaho, just east of Spokane, Washington and west of Montana. The average July high temperature is 82 and the average January low is 22. The wettest month is December (3.5"). People enjoy the lack of humidity and the mild 4 seasons. Regal Cinemas has 14 screens in the large Riverstone development. There are multiple art shops and popular local coffee shops lined up along "Sherman Avenue". North Idaho College and its 3000 students contribute to local culture, as do local festivals and sporting events. The "Moose on the Loose" program features full-sized painted moose in downtown locations. Kootenai Medical Center is an accredited facility that serves the area. I 90 runs through Coeur d'Alene. There is a local airport, Pappy Bovington, with air taxi operations. Spokane International Airport is 40 miles. There is free local bus service, which can accommodate bicycles. The North Idaho Centennial Trail bike path goes through the Riverstone complex. When compared to other cities, Coeur d'Alene is a little below average in walkability.